Chance occurrences? They happen. Life-changing chance occurrences? They happen too. 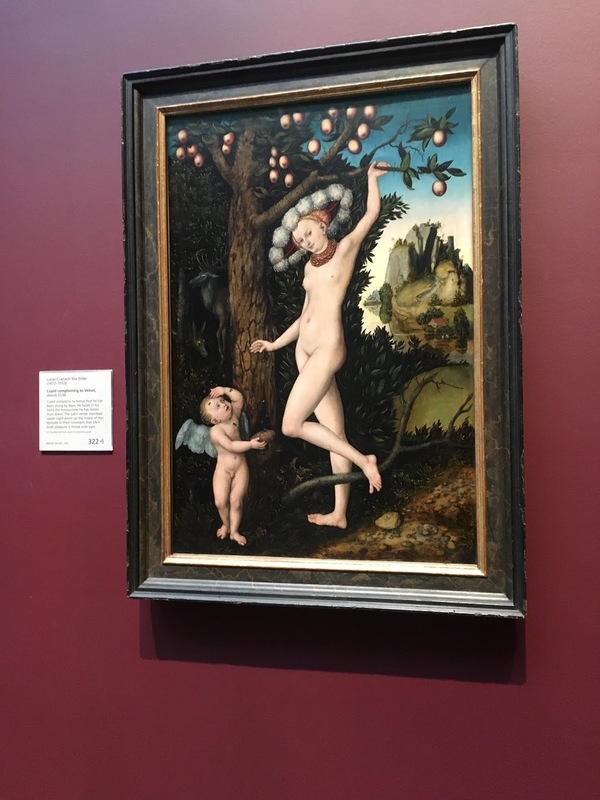 Listening to a performance of Bach's Chaconne and later seeing Lucas Cranach the Elder's Cupid complaining to Venus in Room 4 of the National Gallery quite possibly did it for me last Friday. Music first: It was the video* of members of the New York based Limón Dance Company** dancing to the Bach Chaconne played live in their studio by violinist Johnny Gandelsman that seized my ears. Apologies if I have not managed to upload it here in a playable form: I will go on trying. Or go direct to @stradmag on Twitter and scroll down to Friday 17. I wonder if you can imagine this music before your ears open to it, this highest of high art. Bach was writing the Partita of which the Chaconne is the final part between 1717-20. Cranach was painting Cupid and Venus, the painting that seized my eyes, around 1526-7, two centuries earlier. Yet the sources seem similar, at least in artistic terms, the solemn, celebratory or seasonal dances dating from before the Renaissance: gigues, gavottes, sarabandes, allemandes, all of them gradually becoming formalised and standardised through the Baroque period and beyond and taken to the highest state of art by Bach in his Suites. What melodies Cranach had heard while he painted we know not. But the way he depicts Venus is dance-like in her graceful, balletically attenuated descent, called to earth by her lovable little imp, her face a study of maternal forbearance. Cupid has stolen a honeycomb and been well stung by the angry bees. Cranach painted the subject many times. The inspiration was a poem by Theocritus. The version in the National Gallery (acquired by purchase in 1963) is for my money the best of the lot. In it Venus wears the kind of a-la-mode hat with ostrich plumes that Cranach had earlier used for his depictions of royal hunting parties. Sheer painterly panache. In the poem, Cupid does have a question for his mother. Look at these tiny insects he exclaims. How can they make these great big painful wounds? Well, look at you she says, ask yourself how can such a little boy make such a big, painful wound every time you shoot one of your arrows. Room 4, German works, is filled with such wonders. Have a look at them before your visit at this link.